I can’t remember if I picked a word at the beginning of 2018. I used to choose one faithfully, but that practice hasn’t had as much of a draw for me in the last two years as it once did. In the early years (starting with the year I chose fearless), my word helped pull me forward as I got closer and closer to the authentic and meaningful life I longed for. I made some big life-altering decisions in those years, partly because my annual word helped clarify my intentions and chart my path. This past year, though, there’s been a shift, and my life has felt deliciously close to what I was dreaming of all of those years when I was choosing words. I don’t feel as much like I need an annual word to draw me forward anymore. The only thing I can think of for 2019 is “more of the same”. This year, instead of choosing a word at the BEGINNING of the year, I’m selecting one at the END that reflects what the year has been. For 2018, that word is Joy. This is a unique place for me to be, and, as I wrote earlier this year, there’s been some uneasiness claiming joy.I’ve become much more familiar with grief and struggle in my adult life, and so joy feels like a foreign country. 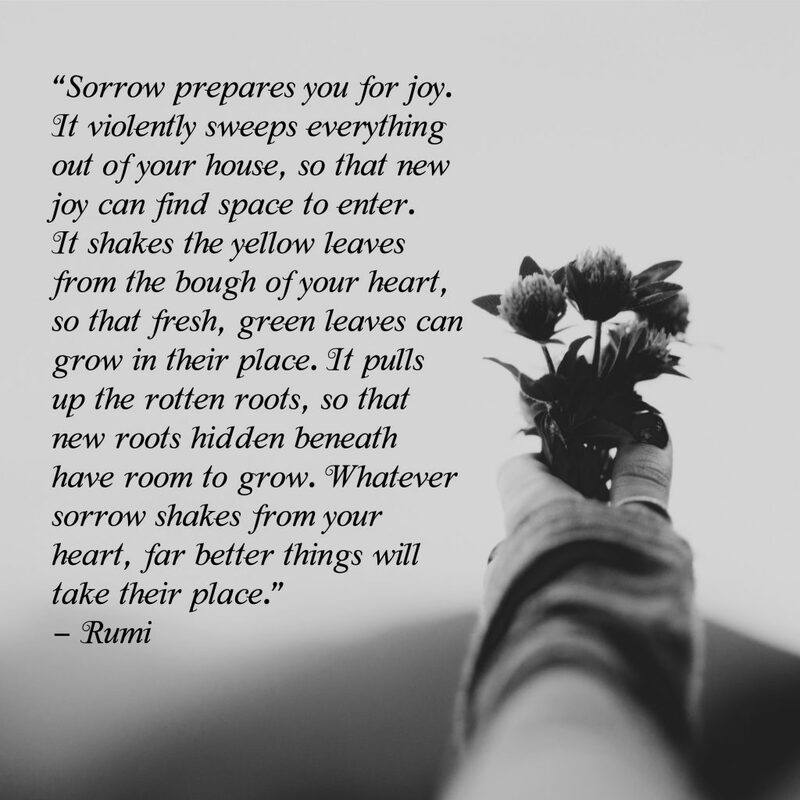 But after a year of deepening my practice around receiving and appreciating joy, it’s become a more comfortable place to live and I don’t plan to leave any time soon. 1.) When you find contentment, stay there until you feel restless again. In choosing “more of the same” for 2019, I am acknowledging that I’ve arrived at a place of contentment and “enough” and I’m in no hurry to change anything. HOWEVER… I know my patterns well enough to know that I will continue to need growth and change in coming years, and so I surrender to the ebb and flow of life, resting when the time is right, and moving when I start to feel restless again. 2.) Joy may look different from what you expected. Embrace it anyway. There was a time when I was certain that a joyful life would be one in which I was well-partnered, with someone to come home to who would know just how to give solace to my weary heart when I’d been out in the world too long. That hasn’t happened for me this year, and though I still welcome the possibility of it in the future, I have found this single life to bring more joy than I ever expected. 3.) Find people who’ll hold space for you not only in sadness, but in joy. As I often discuss in my Holding Space Coach/Facilitator Program, though it sounds counter-intuitive, it’s often easier to hold space for someone when they’re sad or lonely or have some kind of need you can fill. When they’re joyful and content, it can feel like they need you less. But a joyful person needs deep friendships just like a struggling person does and I am so very grateful for the people who’ve shown up for me in my joy just like they did in my grief. 4.) Joy may show up in places you expect it least. One of the most joyful days of the year was in one of the poorest places in the world, surrounded by people who know struggle, who’d lived through conflict and poverty, and yet who know how to dance and laugh. 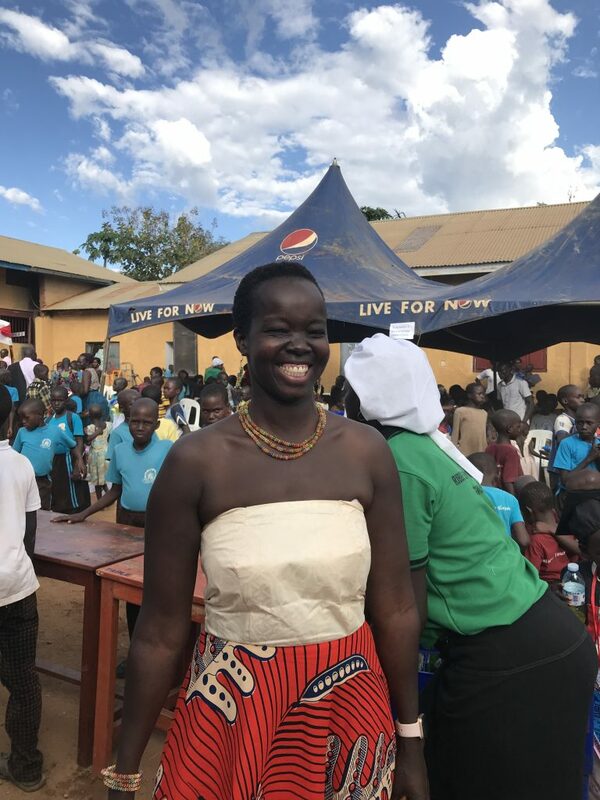 In Kitgum, Uganda, I laughed harder than I have in a long time when, at the Kindergarten graduation, the women invited me up to dance and I made a fool of myself trying to move my hips the way they do. 5.) It is easier to give from a place of abundance. If you want to be generous and to make a difference in the world, fill your own cup first. This year, I was able to give away more money than I’ve ever given, I held space for more clients than I ever have, I lent money to a few people I care about who are struggling, and I taught well over a hundred people through my online courses and in-person retreats. I could do all of this without feeling depleted because I’ve done a LOT of radical self-care the last few years (and continue to do so). I went to therapy, I’ve found spiritual practices that sustain me, I took sabbaticals and vacations when I started to feel depleted, and I spent time, energy, and money making my home feel more like a sanctuary. Some of what I’ve done for myself might look selfish to an outside observer, but it allows me to give generously without resentment or exhaustion, so I make no apologies. 6.) Boundaries help nurture and protect a joyful life. Becoming increasingly fierce and protective of my personal boundaries has helped me find this place of joy and protect it from those who might seek to diminish or destroy it (because of their own lack of joy). Because I know that my joy is worth protecting AND it helps me do better work and serve more people, I have become much more intentional about saying no when I’m depleted, limiting the time I spend with people who diminish my joy, and guarding the time and resources I need in order to feel well-resourced. 7.) Healthy relationships help grow a joyful life. Much of my joy comes from the time I spend with the people who matter to me. I have grown and deepened some beautiful friendships this year and I have been intentional about carving out ample time for deep and slow conversations. I have also been blessed with the best clients in the world who fill my cup every time I am in circle with them. AND I have three daughters who bring me joy. I spent as much time as I could with them this year, taking them on two vacations, knowing that there will come a time in the not-too-distant future when they will all move away from home. One of my favourite weeks of the year was a joy-filled week of play at Disney World with my girls. 8.) Joy isn’t always about ease – sometimes it comes as a result of considerable struggle. There have been many moments this year when joy came after a lot of hard work, sweat, and tears. As I wrote about my time in the Netherlands, a retreat that took us through some hard liminal space was one that ended with deep learning and much joy. This has also been true as I’ve renovated my home and backyard. I find great joy and satisfaction in completing something that stretched my physical and/or mental capacity. 9.) And then, sometimes, it IS about ease. I have found deep rest and relaxation this year – times when I’ve spent a long afternoon lounging in the hammock in my new backyard, or when I’ve taken a long leisurely hike through the woods. There was very little external stimulation needed in those times – just spaciousness and ease. 10.) Doing good and meaningful work is one of my greatest sources of joy. A year and a half ago, I launched the Holding Space Coach/Facilitator Program. Since then, I’ve taught about 200 people through the online program and in-person retreats. It took a LOT of work to build this program from scratch and it continues to take a lot of work to grow it and teach it and hold space for the people who come to it. It’s a deep program and it’s not always easy to support people who have to dig deeply into their own blindspots, fear and internalized oppression in order to grow their comfort with the liminal space. AND… despite how much it asks of me (and perhaps BECAUSE of how much it asks of me) this work gives me more joy than I ever could have imagined. I hope that in 2019, you, too, will find joy and contentment. Want to learn more about holding space? Check out my Holding Space Coach/Facilitator Program. The next session starts in January 2019. I sweat. A LOT. And my face turns beet red when I exert myself, so if you’re ever present when I exercise (which, sadly, isn’t often enough) you won’t be able to miss the evidence of my efforts. But this post isn’t about physical exertion. Instead, it’s about the kind of sweating (both physical and metaphorical) we do when we’re under stress, when we’re afraid of failing, or when we fear that people might be disappointed in us. Mostly, it’s about vulnerability and when it’s okay to reveal our flaws, our fear, and our fumbling. Thanks especially to writers like Brené Brown, lots of people are talking about the value of vulnerability, but what’s sometimes missing from the dialogue is the nuance of WHEN it’s appropriate to be vulnerable, HOW MUCH vulnerability is appropriate, and WITH WHOM it’s okay to be vulnerable. What if, for example, you’re in charge of keeping people who are more vulnerable than you safe from harm (small children, for example) and you admit that you have no clue how to do so and suddenly they feel even more unsafe than before? Was it wise, in that situation, to show your vulnerability? Probably not. That might be when it’s wiser to put on a brave face and prioritize their needs over your own. As a parent, there have certainly been times when I had to keep my fears and self-doubts to myself (or when I cried behind my bedroom door) because it wasn’t in my children’s best interests to doubt my ability to protect or provide for them. As they’ve gotten older, I’ve increased how much I’ll admit my flaws and fears to them, but in the early days they needed my strength more than my vulnerability. Or what if, by becoming vulnerable, you’re drawing the attention away from the people who need it more than you do and then your vulnerability becomes a stumbling block rather than a building block? If, for example, you’re working with traumatized or oppressed people and you can’t stop crying about how much the work is impacting you, you’re likely making it about yourself rather than about them. Suddenly those people have to spend their energy caring for you rather than themselves. That’s when it’s best to take your vulnerability somewhere else where people have more capacity to do emotional labour on your behalf. Or what if you haven’t gained enough trust in the other person or people and you suspect they might further harm you or use your vulnerability against you? Some people are masterful at manipulation and at using other people’s weaknesses to their own advantage (someone who’s trying to sell you an expensive coaching program, for example). Other people may be less intentional about it but still harmful in how they respond to you because of their lack of capacity or self-awareness. With those people, it’s better to withhold your vulnerability rather than put yourself at risk. Vulnerability, then, is best shared with people who have earned your trust, people who aren’t under too much of their own burden at the time, people who aren’t fully reliant on you for their own safety at the time, and/or people who have enough emotional intelligence and self-awareness to respond in appropriate ways. Recently, I found myself in a dilemma about whether or not my vulnerability was the best course of action. I was facilitating a three-day workshop on holding space in the Netherlands, and, to be frank, it wasn’t going well. By the end of the first day, I could sense that there was dissatisfaction among participants and I wasn’t sure why. I had started the workshop in much the same way I’ve started many other workshops, and those workshops progressed much more smoothly, so I didn’t understand the source of the problem. Was it because I was tired, having just spent an intense week in Uganda? Was it the cultural and/or language differences, since this was the first time I was teaching in a place where English isn’t the first language? Was I using language or a teaching style that wasn’t relatable to this audience? Was there some pre-existing conflict among participants that they’d brought with them to this space? Or was it because I’d started with the basics of holding space and many people in the room were already experienced practitioners who wanted higher level training? One of the things that I sensed was going on (that I picked up from some of the comments coming my way) was that my style of facilitation was falling short of what people had expected of me. There were quite a few experienced facilitators in the room, and most of them had been trained in styles that are different from my own (ie. systemic constellations, for example, which incorporates more movement and less conversation than tends to be my primary style) and I began to feel the scrutiny of their evaluation. On the morning of the second day, trying to adapt to the style that I sensed they were more comfortable with, I made changes to the process. But that didn’t seem to be sufficient – I got even more feedback during the breaks that indicated the dissatisfaction was growing rather than dissipating. (Sadly, dissatisfaction is contagious and even those who’d seemed happy earlier were now starting to squirm in their seats.) What was especially challenging is that the feedback was often contradictory – one person would come to tell me that they needed more of one thing, while another person would come to me five minutes later to say that they needed more of the exact opposite. It seemed there was no way of meeting all of the expectations in the room, not even if I contorted myself to try to satisfy people. By lunchtime on the second day, the picture started to become more and more clear to me. There was an expectation in the room that was, quite honestly, impossible for me to live up to, because it was an expectation crafted out of who they THOUGHT I was and not who I REALLY am. A couple of people, in their conversations with me, referred to me as the “Queen of Holding Space”, and it wasn’t reverence I was hearing in their voices but disappointment. These people – because my work has been broadly circulated in certain circles in the Netherlands – had constructed an image of me as a guru who knows all there is to know about holding space and who would walk into the room and wow them immediately with my exquisite ability to hold space. Unfortunately, I walked into the room fully human, fully flawed, a little jet-lagged, and with a lot that I still need to learn about holding space. 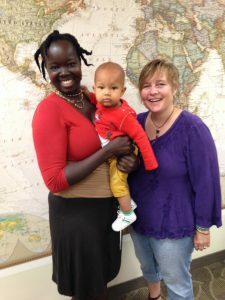 I didn’t speak their language (not only the language of their country, but the language of a systemic understanding of the world), I didn’t facilitate in the way that they’d become accustomed, I made mistakes, and the opening check-in circle dragged on too long so the opening pace was slow. Over lunch, I agonized over what was the right thing to do. Should I just keep trying to adapt my style to find the sweet spot that might satisfy the highest number of people in the room? Or should I simply push through with how I’d planned the workshop and hope that by the end, something of value would be transmitted? Should I hide my fear and flaws in the face of these people who looked up to me and pretend I was oblivious to their dissatisfaction? OR… should I speak my vulnerability out loud, trust them to have the emotional intelligence to receive it well, and hope that it might help us collectively dive deeper into our learning? I chose vulnerability. I knew it was a risk and I knew that I might lose some credibility (and people might leave even more dissatisfied than they already were), but it seemed like the only viable option. I told them that I’d become aware that there was a shadow in the room and that that shadow was a reflection of the way that I was letting people down. (In process work such as this, the shadow refers to “that which is hiding under the surface which is unspoken and therefore potentially destructive”.) I said that I wasn’t interested in the pedestal that people had put me on – that pedestals are lonely, dangerous, and uncomfortable, and that I prefer to be in the circle, alongside them, doing the work in messy and flawed ways and learning shoulder-to-shoulder. I spoke of my imperfections and told them I knew I wouldn’t be able to meet all of the expectations in the room. I promised, though, that I would continue to do my best to offer them what I have learned so far about holding space. I invited them to trust me and to stand by my side as we went deeper into the learning and into brave space together. My sharing, like everything else I’d done up until that point, was imperfect, and when I was finished, I wasn’t sure what to do next. When I looked around the room, what I thought I saw was a softening and greater acceptance of the imperfection and releasing of the unmet expectations, but I wasn’t sure if I was interpreting it correctly. Slowly, though, things started to shift, and, in the end, my vulnerability helped us go where we needed to go as a group. It didn’t happen magically (there was still some resistance that afternoon) but gradually the energy in the room shifted. We stepped more deeply into a place of trust, depth, and bravery. Other people began to open up and some spoke to their own wrestling with what had been going on in the room. The next morning, a couple of moments of inspiration helped to take our learning to an even deeper place. First, I shared a story of how I’d been invited to dance with Ugandan women the week before, how miserably I’d failed at it, but how I recognized that it was in brief moments of my most pure surrender to the music and to those who lead me in the dance when I could most successfully move with the rhythm. “That place of surrender is what brave space is like,” I said. “And today, as we finish up this workshop, I want to invite you into that dance of surrender and trust. I’m asking that you trust the music and that you trust me, as your leader, to know what the rhythm in the room needs to be.” I looked around the room, and what I saw looking back at me were nodding heads and a deeper trust than I’d witnessed up until that point. By the end of that third day, the energy had completely changed, and the workshop ended with some of the warmest hugs and words of appreciation I’d ever received. Several people remarked on how we, as a group, had been through a liminal space journey together – how we’d started with one version of who we were and what we expected, how my vulnerable sharing had helped us let go of that story and those expectations, and how we’d emerged into something new. 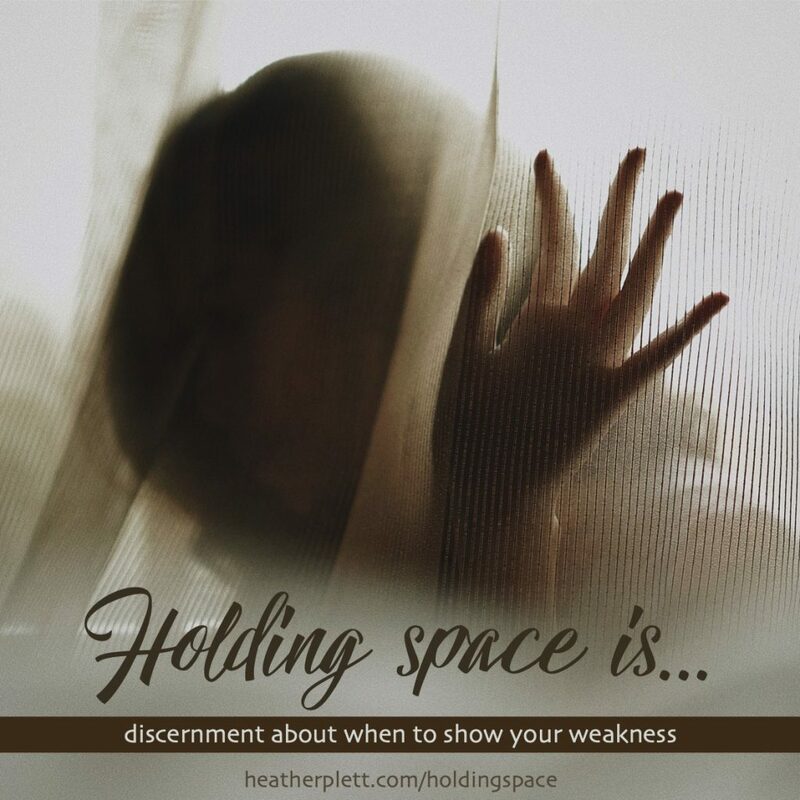 This is one of the first things I teach in my holding space workshops – that when we hold space, we have to be prepared to hold the complexity of the liminal space. It’s quite possible that my vulnerability could have backfired and that people might have left the room frustrated and disappointed. (Perhaps some did and I’m not aware of it.) It’s never a guarantee when we take a risk like that. But more often than not, I’ve found that my willingness to be imperfect and authentic, as the leader of that space, is directly correlated with how deep the learning can go. Secondly, I paired the vulnerability with strength – letting them know that I was still prepared to take responsibility for leadership and for making decisions about what direction the workshop would take. I invited them to trust my sense of the right pace, content, etc. As in the Buddhist teaching around warriorship, I practiced showing up with a “strong back and soft belly” – prepared to show them my vulnerability while still carrying myself with strength. In the end, the workshops that take me through the most difficult terrain are usually the ones where I walk away with the most learning. I hope the same is true for those who were there with me. I am forever grateful for their willingness to step into the liminal space with me. What can I tell you about my experience in Kitgum District of Uganda? I’ve tried about half a dozen times to write this article and to reflect on what the experience meant to me, but so far every attempt falls short. I was going to tell you about how it felt to be the only white person I saw for five days (how all of the children would shout “Munu!” – white person! – when I walked by, and how they’d peer in my bedroom window while I tried to nap, like I was an exotic zoo animal), and then I was going to talk about how this trip felt different from my other visits to Africa, and then I thought I’d start by reflecting on how complicated it feels to be white, relatively wealthy, and a representative of colonization in a place like Uganda and still walk with consciousness and humility… but all of those attempts make this story too much about me and what I really want to tell you about is the school that was the primary reason for my visit. 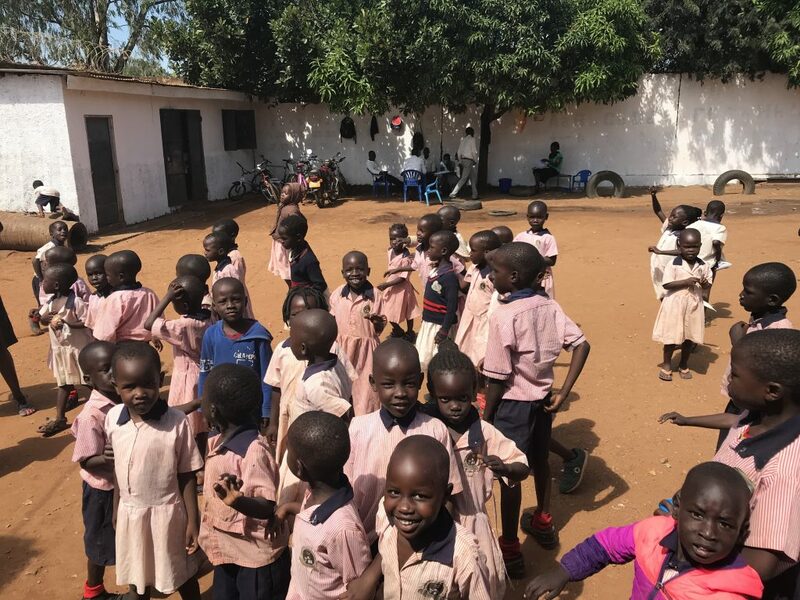 Laker Memorial School in Kitgum District, Uganda, is the school my friend Nestar started five years ago and which I have been supporting financially for almost that long. What I learned on this visit is that it is named after Nestar’s mom, Laker, a strong and courageous woman who believed in educating children and who worked hard to raise school fees for her children despite the many obstacles life threw in her path (ie. they had to flee their farm when her children were still young because the rebels had attacked their region, and she became a single mom when her husband died a few years later). Though the school is currently housed in a temporary facility that was never meant to be a school (they had to cut windows into the classroom walls so that the children would have fresh air), Nestar’s dream is to some day build a new school on the land that her mother owned. Though Laker Memorial School is primitive by western standards (there are few textbooks and no computers, the paint is peeling off the classroom walls, and all of the teaching aids are handwritten by the teachers), it was clear to me as soon as I visited that the level of education is high, that there is a strong commitment to fostering excellence in the children, and that the leadership of the school has passion and a vision for the future. On the first day I visited, I heard some beautiful music drifting out of one of the classrooms and I went to investigate. When I was invited into the classroom, I discovered that the school choir was practicing their school anthem, which had been written by the head teacher (who was delighted to share it with me). They were singing in four part harmony – at a higher quality than any school choir I’ve ever heard in Canada. A couple of days after we arrived, I was welcomed as the “chief guest” at the kindergarten graduation. I was imagining the kind of small-scale graduation ceremonies my children had when they completed kindergarten – where parents perch on the edges of tiny chairs in the kindergarten classroom and the children wear paper mortar-boards they’ve made in class. I couldn’t have been more wrong. This was a full-day celebration that included much music and dancing, a huge feast, a spelling bee, a drawing contest, and many speeches from dignitaries (including myself). It was a joyous day and I laughed harder than I’ve laughed in a long time when the women invited me up to dance and I proved to them that a white woman’s hips just can’t shake the way a Ugandan woman’s can. While I was at the kindergarten graduation, seated with the other special guests, I had the opportunity to chat with several local politicians and community and church leaders from the region (including the school inspector). 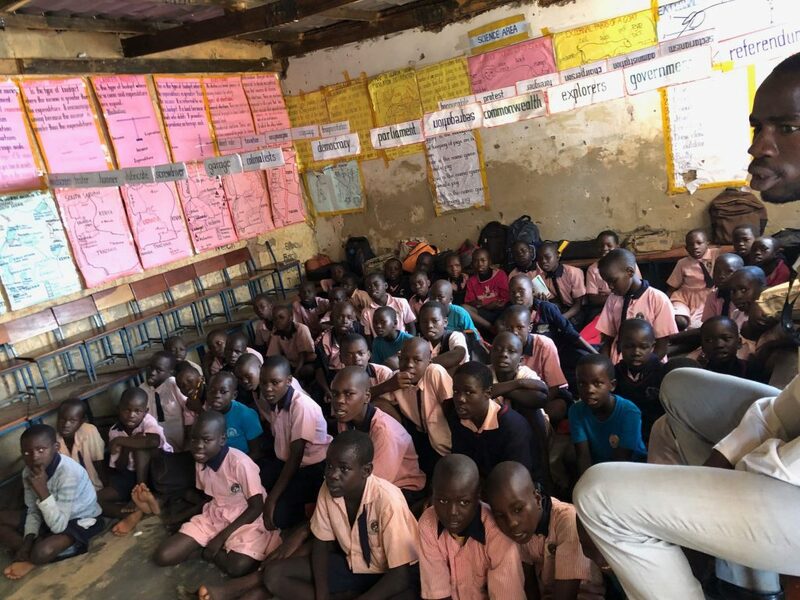 What I heard from all of them is that the school is developing a strong reputation not only in the Kitgum District but across Uganda for quality education and excellent teachers. It was clear from the way that they spoke of it that they too are impressed with what Nestar has managed to create and the quality of people she has attracted to serve in school leadership. To give you a sense of who Nestar is and what she brings to the school and the children being educated there, I want to share a little story of a tiny moment that represents so much more of what I witnessed in my time with her. During the spelling bee, when kindergarten students were taking turns spelling the words read by the teachers, she took aside one of the boys who had failed to spell his word. “Don’t ever be afraid to try,” Nestar said to the young boy, leaning over to look him in the eye. “You might fail, but at least you tried, and trying is always the first step to succeeding.” She spoke from her own years of experience, having tried a big and bold thing in starting a school, knowing she could have failed. If Laker Memorial School produces even a handful of young leaders, like Nestar, who lead with compassion, vision, and humility (and I’m certain it will do more than that), then the world will be a better place. 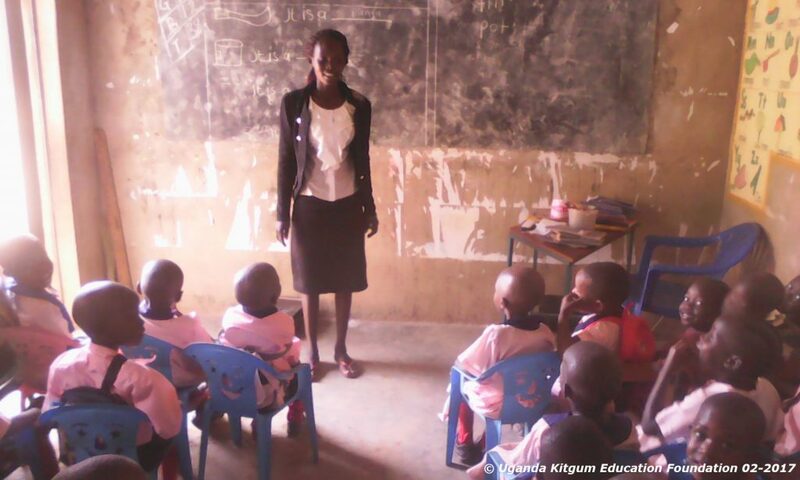 Over the years, I have helped raise money for classroom furniture, textbooks, and, most recently, the construction of a latrine to increase sanitation at the school. Many of you, my readers and friends, have been generous supporters of this school along with me, and I thank you for that. I can assure you that your donations are going to a very good cause and that every dollar is being well spent. I hope that you will consider continued support (you can do so on UKEF’s website) and that perhaps you’ll even consider making a monthly donation. These children have hope for a better future because this school exists. “I don’t think of myself as a leader.” I hear that statement often from my clients and I understand it – I used to say the same thing myself. It wasn’t until a special mentor/boss took me aside and told me that she saw leadership ability in me and then offered me my first leadership position that I first started to recognize that I had capacity to lead. One of the reasons that the people I work with don’t see themselves as leaders is because they equate leadership with authoritarianism. In their experience, a leader is in control, has more knowledge than those they lead, provides solutions to all of the problems, and makes all of the tough decisions. In an authoritarian model, the leader has “power over” their subordinates and is expected to be the authority on all things. While that form of leadership may be desirable for some people (especially those who feel fearful about their safety) and may be necessary in some situations (when children are small and need to be kept safe, or when a country is at war), it can easily become destructive and disempowering. 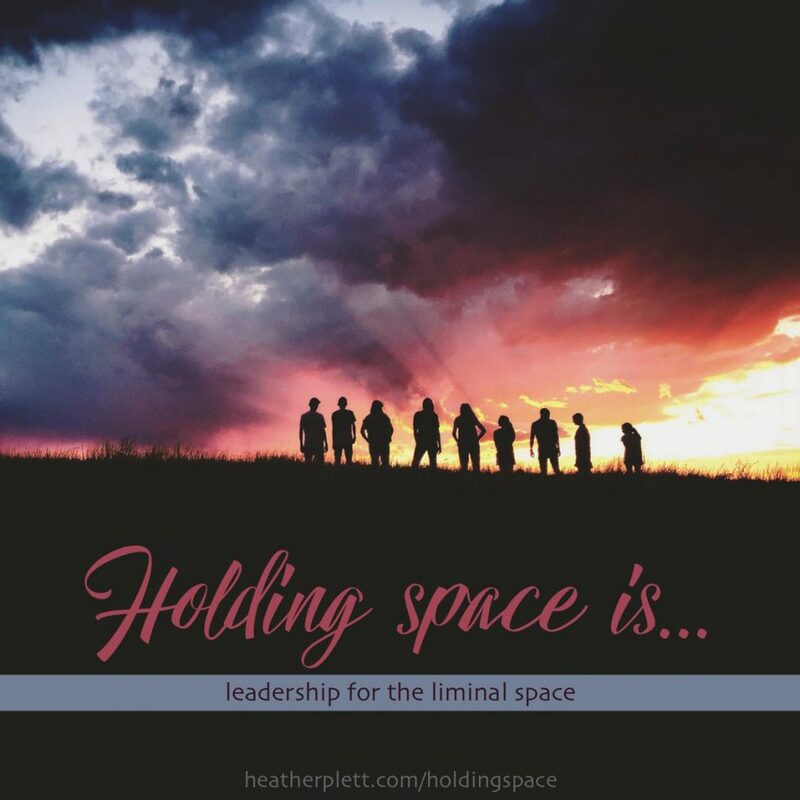 Anyone who’s attracted to what I teach about holding space is not inclined to seek out or emulate that kind of authoritative power and has likely witnessed its destruction, and so they steer clear of the mantle of leadership. Instead of steering clear of it though, I’d like us to consider an alternative model that fits us better and that I believe is badly needed in the world today. I’d like to invite us to consider what it means for a leader to have “power with”. Whenever I talk about leadership, I usually end up back at the place where I started, twenty years ago, when I first started to explore what it meant to be a leader. The first three books that really landed for me and helped me define the kind of leader I wanted to be were Turning to One Another: Simple Conversations to Restore Hope to the Future, by Meg Wheatley; The Authentic Leader: It’s about Presence, not Position, by David Irvine; and Calling the Circle: The First and Future Council, by Christina Baldwin. I read a lot of other leadership books (and some of them are listed on my Books & Resourcespage), but these three helped me ground myself in the leadership model that felt most authentic and intuitive for me rather than the one that I saw reflected in the world around me. These books made leadership feel possible because they were about leading from a place of humility and authenticity rather than authority and control. I didn’t have to be invincible or unflappable to be a leader – I could bring my flaws, my insecurity, and my humanity into the role. I could step into it with curiosity and openness and I could rely on those I lead to bring their skills to the table where mine were lacking. knows how to hold space for complexity, growth, change, etc. Meg Wheatley says that “a leader is anyone willing to help, anyone who sees something that needs to change and takes the first steps to influence that situation.” In other words, we don’t need to wait until we’ve been given leadership positions in order to lead – we simply have to notice the need and step in to offer what we can to help fill it. Humility. It takes humility and a willingness to give up the need to be right in order to be a collaborative leader. Effective leaders share the spotlight (or step out of it entirely) and share the credit (or give it to whoever earned it). Their humility is not self-deprecating, nor does it mask insecurity, but rather it is honest, authentic, openhearted, and courageous. Humility welcomes the brilliance of others and doesn’t need to outshine it. Generosity. Collaborative leaders are generous in their support of other people, generous in offering up their time to others, and generous in how they encourage and inspire people. They don’t see everything they do as transactional (ie. “I’ll do X for you if you do Y for me.”) but instead invite people to function in a “gift economy”, offering up their best toward the common good. Self-awareness. Self-aware leaders recognize and admit their weakness, take responsibility for their mistakes, and don’t project their baggage and unhealed wounds onto other people. They also know their strengths and capacities and aren’t afraid to step into their own power. While they embrace community and collaboration, they don’t approach people from a place of neediness, seeking out other people’s affirmation and validation. Self-regulation. When effective leaders are overwhelmed, stressed out, or triggered, they practice self-regulation (and/or have support systems that help them co-regulate) in order to calm and control their emotions rather than dumping them on other people. They’ve done enough personal growth work that they recognize how much instability can be created by their dis-regulated emotional outbursts, and so they work to create a more stable and safe environment for everyone. Self-forgiveness. While self-awareness, self-regulation, and generosity are important qualities, leaders are still human and they’ll mess up occasionally, and do selfish things or react to triggers in unhealthy ways. When they do, they take responsibility for it, make any necessary restitutions, learn what they need to from the experience, and then practice self-forgiveness and self-care. Courage. Courage is defined by Google as “the ability to do something that frightens one” and “strength in the face of pain or grief”. I like the combination of these two definitions because it’s not about the absence of fear, but rather the ability and strength to act in spite of it. Effective leaders might be quaking in their boots, but still step forward and do and/or say what’s right. Courage is contagious – when we are in the company of those who practice it, we are more inclined to find the capacity in ourselves. Power. When I first turned away from authoritarian leadership and chose a different model, I thought power was a dirty word, but I’ve changed my mind since. Power is only dirty if it is abused and if it exists apart from love. As Martin Luther King said, “Power without love is reckless and abusive, and love without power is sentimental and anemic.” Effective leaders aren’t afraid of power – they claim it, share it, and use it with love. Resilience. An effective leader can survive struggle and opposition and can find their way back to strength. It’s not that they are never beaten down – they are – but they get up the next day (or the next week, or month) and do what needs to be done to get back on track. If one path doesn’t work, they adapt and find an alternative. If one attempt fails, they try something else. Repeatedly, they return to their sense of purpose and meaning and they persevere. Meaning-making. When I first started learning about leadership, I kept hearing about how a leader had to have a sense of vision, and while I agree to a certain point, it always felt like there was something missing from that model. A vision might inspire us for the future, but what about the present? Instead, I now focus on meaning-making. An effective leader strives to make meaning out of the current moment even when the vision is blurred and the future looks dim. Even when there is only struggle and no hope, a leader looks for meaning and purpose. The ability to hold space. This may be the competency that is the most counter-cultural when compared to an authoritarian leadership model. An effective leader is willing and able to be present for others while they make the journey through liminal space. They don’t impose their own desired outcome and they don’t rush the process. They practice mindfulness and presence, while not backing away from complexity and confusion. This is only a partial list, and I can think of others (like the ability to build strength in diversity, for example), but this is, at least, a start in exploring what kind of leadership we need for times like these. I wonder how the world might change if we seek to be, to follow, and to elect leaders like these. I’m going to Uganda! Will you help me raise money for a toilet? I’m going to Uganda! In a surprising twist, while I was planning my trip to the Netherlands to teach in November, a window of opportunity opened up and I can’t pass it up. As you may recall, for several years, I’ve been supporting a school in Uganda that was founded by my friend Nestar. About a dozen years ago, Nestar spent a year in Canada as the youth intern on the team I was leading at Canadian Foodgrains Bank and I loved getting to know her. Since then, Nestar moved to the Netherlands where she got her Masters degree and started a family, but she never let go of her dream of doing something meaningful for the community where she grew up. 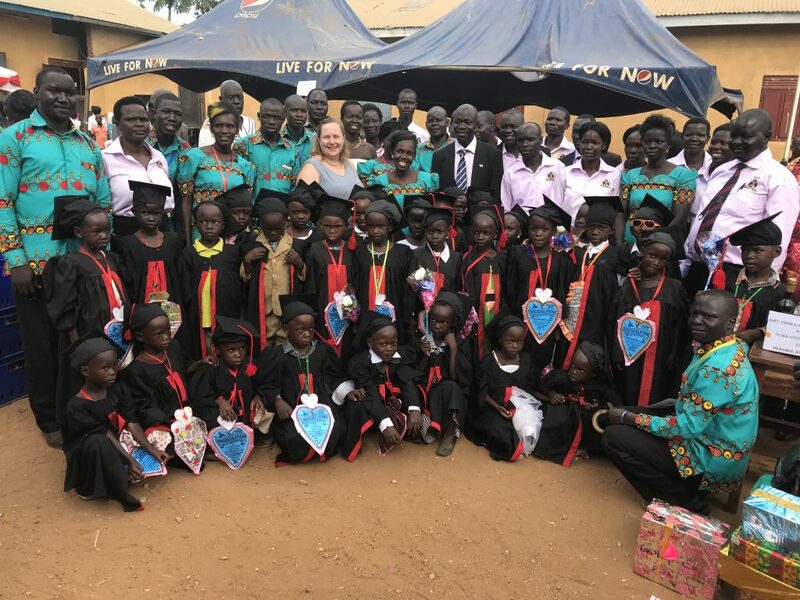 When her oldest son’s health made it difficult for her to move back to Uganda as she’d intended, she began directing her energy into creating a foundation to build a school in Kitgum region. A thriving school has grown out of Nestar’s dream and I’ve been delighted to witness and support it from afar. I’ve long held a little dream of visiting that school and it seems that now is the time. Nestar and I will meet there and we’ll spend some time at the school together. The timing is perfect, because we get to be part of the graduation ceremony for the students who are leaving the school. So, my friends… would you help us ensure that the school has sufficient bathroom facilities to support their growth? They need approximately $1800 CAD to complete this project. That’s not a lot of money, so I’d like to set the goal a little higher. Will you help us raise at least $5000? The school functions on a very tight budget and they’re growing, so I’d like to leave them with a little breathing room for paying teachers, buying books and furniture, etc. This school is a special place and one of the reasons I’m so committed to it is because it was founded and is run by people from the region who know the needs of the region and care deeply for their own people. Far too many non-profits trying to “fix” things in Africa or other places in the world are doing so as outsiders trying to impose their own sense of what a region needs. That isn’t the case here. As a donor, I influence no decisions at the school and simply send them funds and trust that they know what is needed. They know their own needs and solutions and simply need some financial support in order to serve their own community. 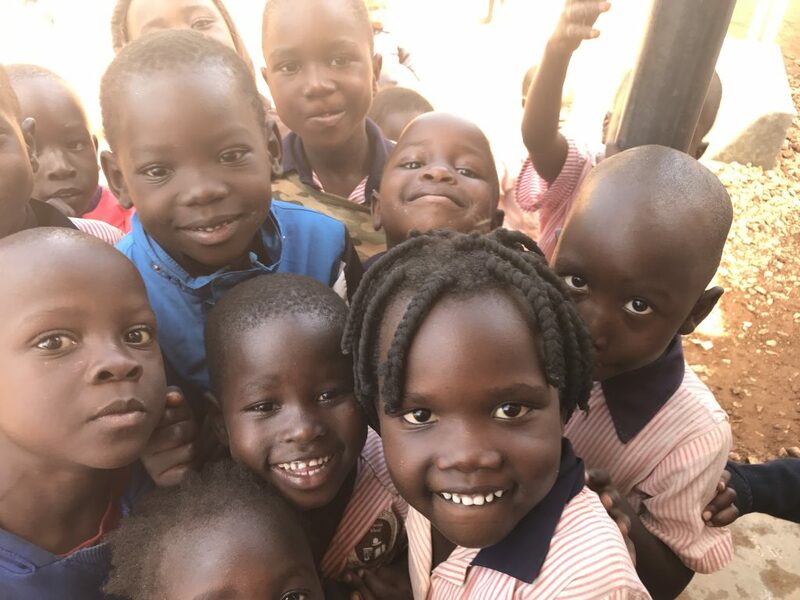 Another thing that’s important is that the foundation has very low operating and administration costs (it’s run by Nestar and her husband as volunteers), and so 95% of your donation will go directly to supporting the school in Uganda. If you’d like to help, use the donate button below and the money will go into my Paypal account. I will be transferring every dollar I receive (plus my own donation) to UKEF (and am happy to show an accounting of it, if anyone needs that assurance). If you feel more comfortable making a direct donation, you can do so at UKEF’s website. If you’d like to hear a little more of the story, here’s an interview I did with Nestar back in 2014.